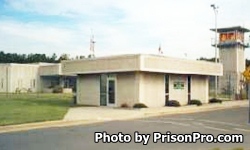 Southern Correctional Facility is located in Troy North Carolina, part of Montgomery County. It is a mixed custody prison that houses minimum custody males, and medium and close custody females. The capacity of Southern Correctional Institution is 624 inmates. Males and females are housed in separate buildings. The female facility is comprised of five housing units. Select males housed in the minimum facility can participate in the work release program and other jobs within the institution including kitchen and custodial duties. Females at the medium/close custody facility have similar on site job assignments. All inmates can receive vocational training in culinary services, and can obtain a GED while incarcerated. Southern Correctional Institution has visitation on Saturdays and Sundays in two sessions. The female facility visiting times are determined by the inmate's housing unit. The male facility has visiting by appointment only. You will need to call the facility Monday through Thursday to schedule your appointment.